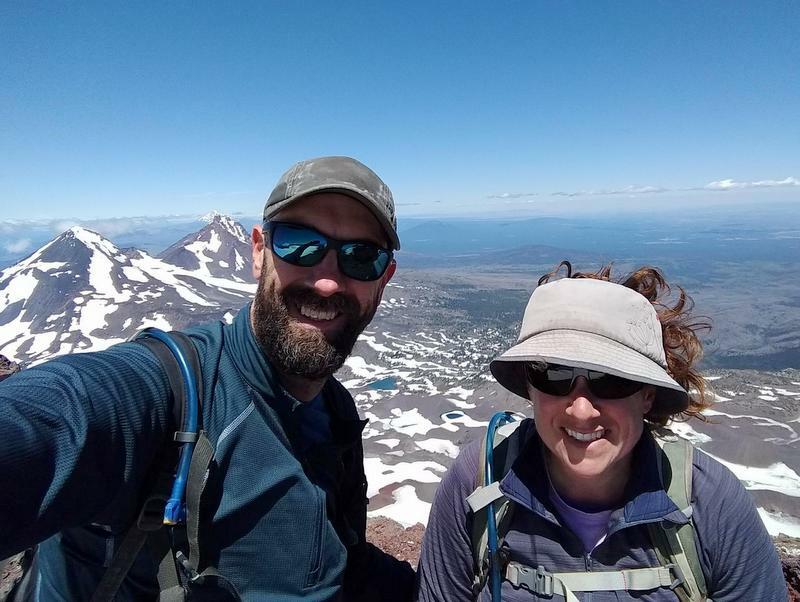 Topping out at 10,363 feet, South Sisters is the third tallest mountain in Oregon and the tallest of the three Sisters Mountains. 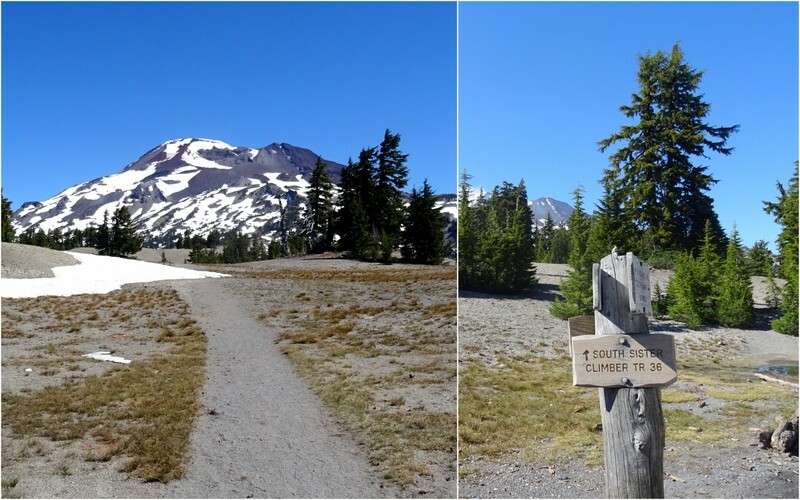 Unlike so many of the surrounding mountains in the rugged volcanic, Cascade Range, South Sisters is considered a beginner mountain because it has an easy hiking path all the way to the summit that doesn’t require any climbing skills. Of course, I’m using the word “easy” for comparison purposes only as there is really nothing easy about this hike. While the hike is not technical in nature, requires no route finding skills, and has only one exposed section with a steep drop off (in other words, practically a stroll in the park compared to every trail we’ve hiked in Utah), the massive 5,000 foot elevation gain in a mere 6 miles of ascent makes this one strenuous climb. Six miles to the summit! We arrived at the trailhead next to Devil’s Lake around 9 am on a sunny Saturday morning. Not surprisingly, the parking lot was overflowing with cars and trucks already. We knew this was a popular hike and that we would be sharing the trail with lots of other people. There was a time when we tried to avoid overly busy trails or other popular activities on weekends. But at some point, we decided to not let crowded conditions hold us back from the things we really want to do. Becuase we’re not retired or independently wealthy, weekends are when we have time for long hikes. So unless we want to stay home twiddling our thumbs, we’re going to be sharing the trail with lots of others. Besides, after hiking up Angles Landing on Thanksgiving (not recommended!) no trail will ever feel crowded in comparison. The first two miles climb up through the forest on a series of switchbacks. We only saw one other hiker on this section and started to wonder if maybe all the cars at the trailhead were backpackers or just people visiting the lake. At the top of the switchbacks, we reached the junction for the Moraine Lake trail. 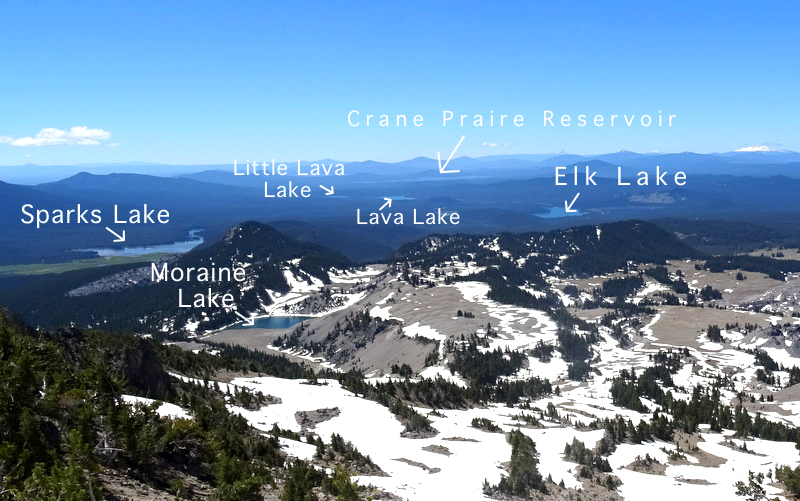 This is where we had turned left to complete the Wickiup Loop only a few days prior. 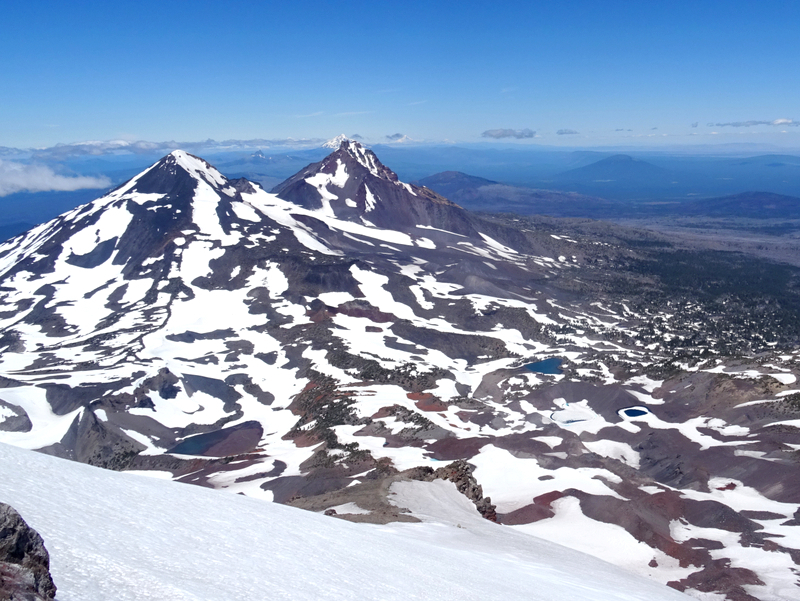 It’s also where we got the first glimpse of the South Sisters summit. From here, the trail followed an easy route across the plateau offering sweeping views of the surrounding mountains and Moraine Lake below. This will probably be the last time I use the word easy to describe any part of this trail. 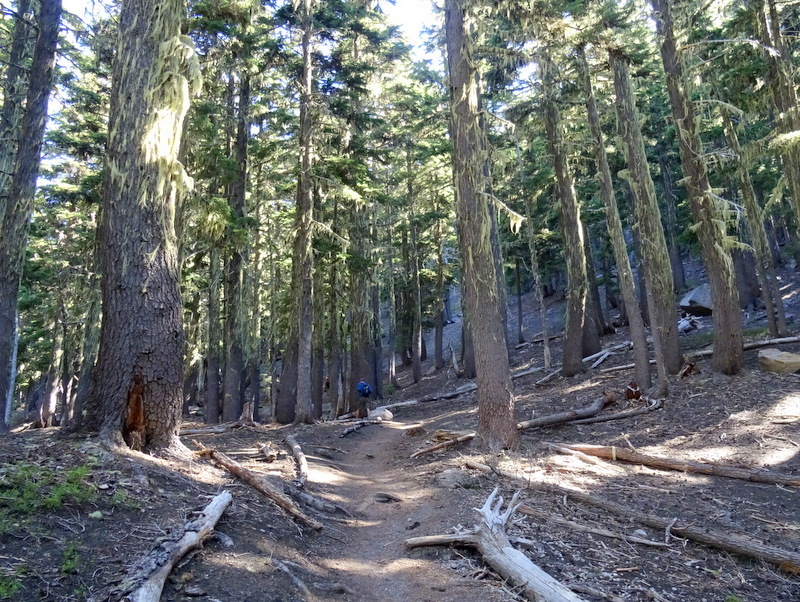 As the wide-open plateau gave way to trees and mountain, the trail began to climb once again. 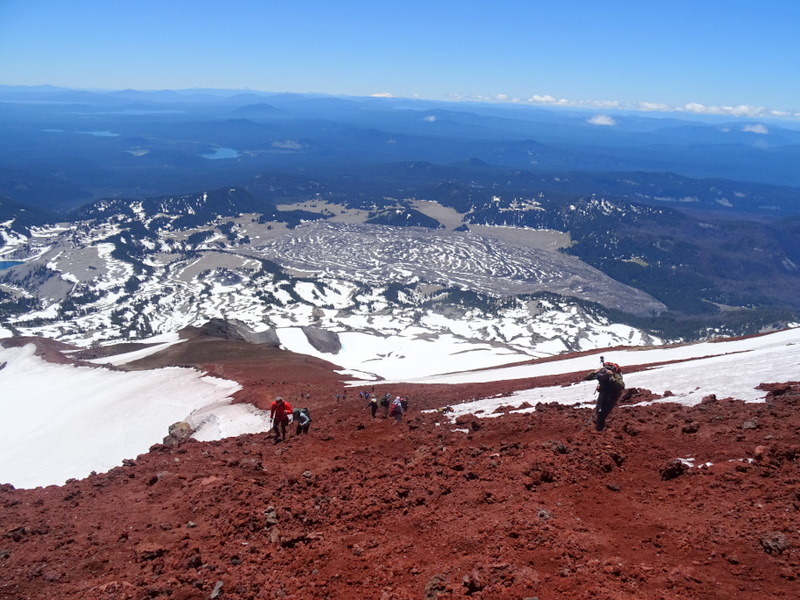 It was at this point that we caught up with several groups of other hikers. A few had skis strapped to their backs. Not sure I would want to carry that extra weight up the mountain, but I bet they had a blast on the way down. 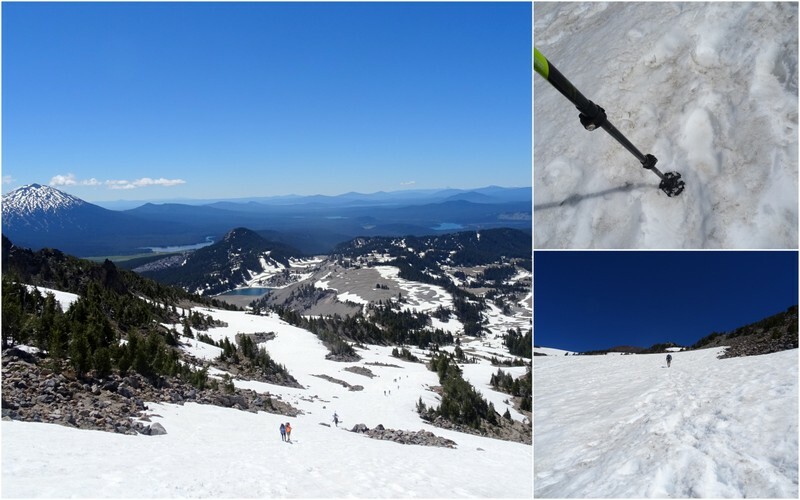 Summer in the mountains – Tim has on shorts, while the guy in front of him is carrying skis! This was the start of a long, steep slog up a snow-covered slope. We couldn’t see the actual trail so we followed the same well-trodden path everyone else was slowly making their way up. It was a little slippery, but luckily at this time of day, the snow was only moderately soft and with each steep our shoes only sunk in a few inches. It was still enough to make the uphill much harder than if it had been a dry surface and I was very happy to have my hiking poles along for the journey. 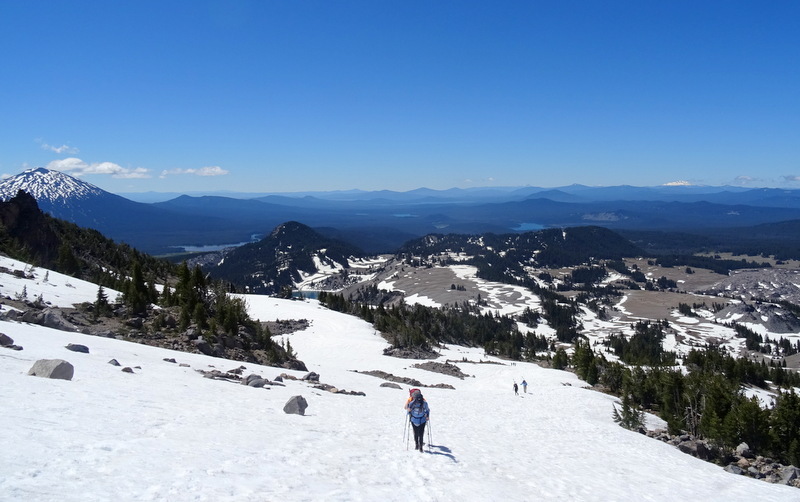 The thrill of hiking in the snow during the summer months never gets old! After what felt like ten miles but in reality was probably closer to one, we made it through the first snowy section. 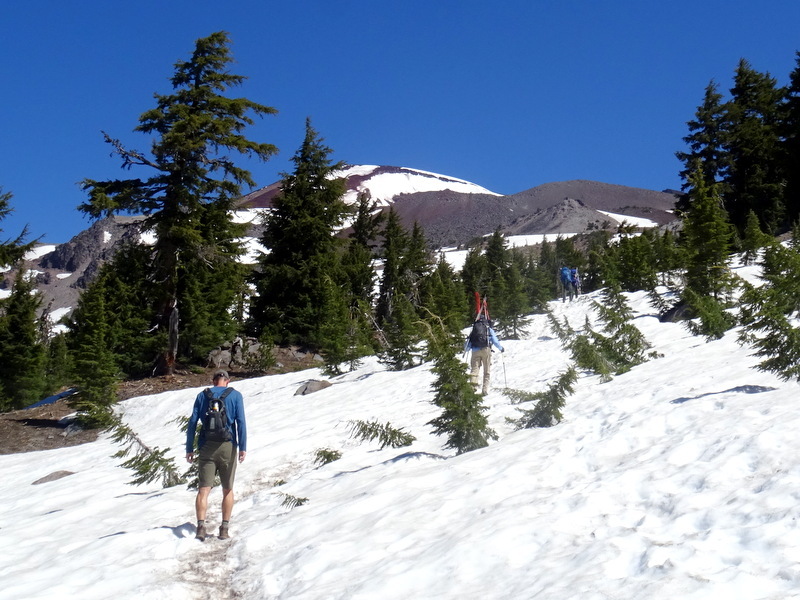 One more short, yet exceptionally steep, climb through some deeper snow and then we were back on dry ground. It had taken us nearly two and half hours to reach this point and I was feeling pretty wiped out. When Tim said that we still had two miles and 2,000 more feet of elevation to go I accused him of lying. How could it be that we were only a little more than halfway to the top!? A hasty decision was made to stop for an early lunch. I eagerly plopped down on the nearest rock to rest and refuel. We didn’t linger long over lunch due to both to the persistent cold wind and the fact that we still had a lot of trail left to hike. The next section was snow free but very steep with some loose rock thrown in for an extra challenge. A final climb up a short, rocky embankment brought us to the saddle and the base of the Lewis glacier. We rested for a moment while taking in the view and contemplating the final climb. 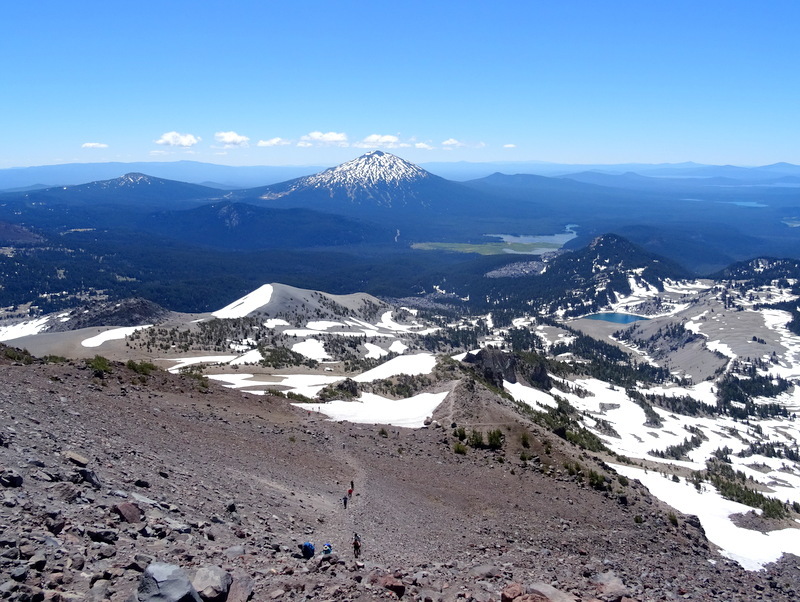 It was only another mile to the ridge, followed by a short 1/2 mile trek over the flat top to the actual summit. Doesn’t sound too bad until you factor in that we still had to go up another 1,300 feet! 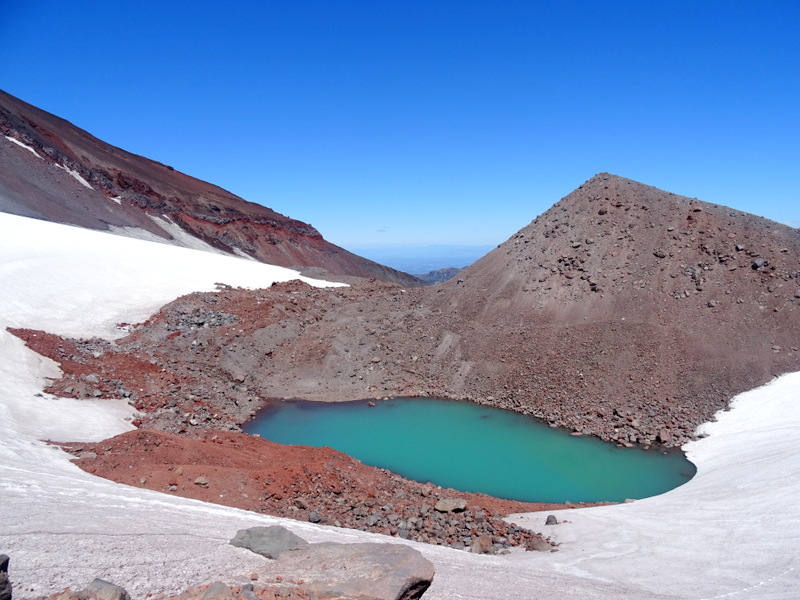 This is a glacial cirque lake. Isn’t that color amazing? I read somewhere that this mile-long section of trail was the consistency of a well-crushed Oreo cookie. I think that might be about right. 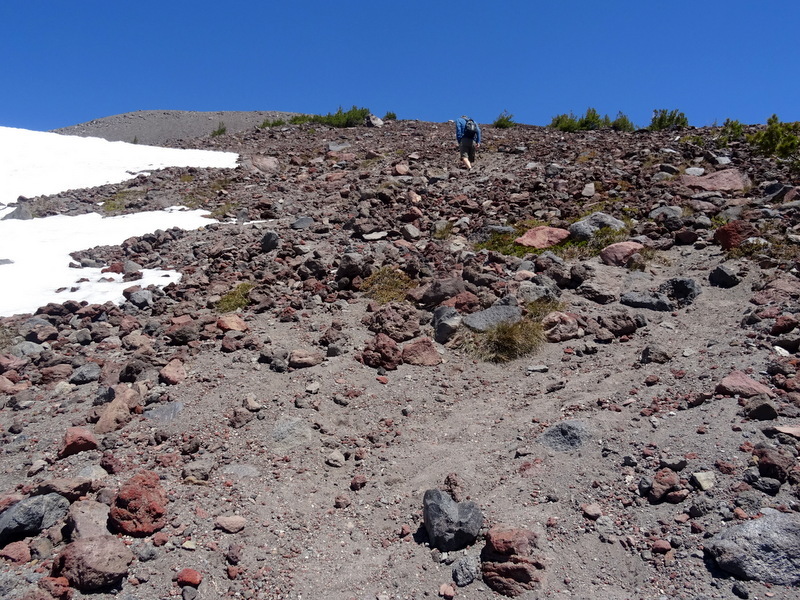 The surface of this very steep slope was made up of millions of tiny volcanic pebbles piled 6-8″ deep. As we scurried up the spider web of trails that zig-zagged up the ridge our feet slid back a half step for every step forward. 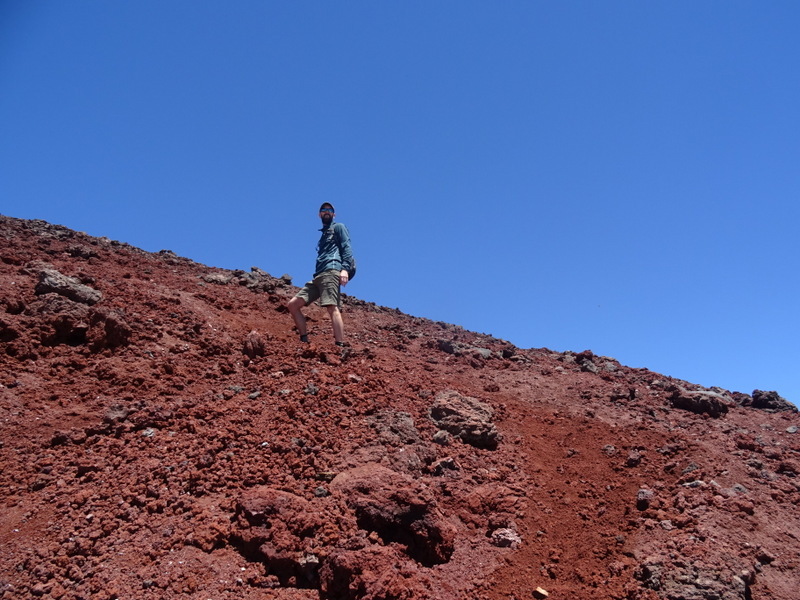 It was very similar to hiking up a sand dune. 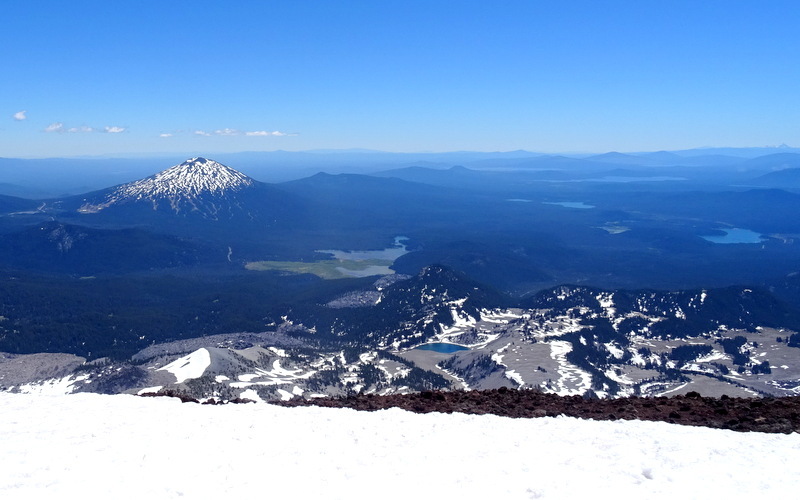 Looking down on Broken Top and the Green Lakes. Only days before we had stood on the shores of the big lake and looked up to this very spot. From the bottom of the ridge, we had seen a line of people near the top who didn’t look like they were making any progress in either direction. 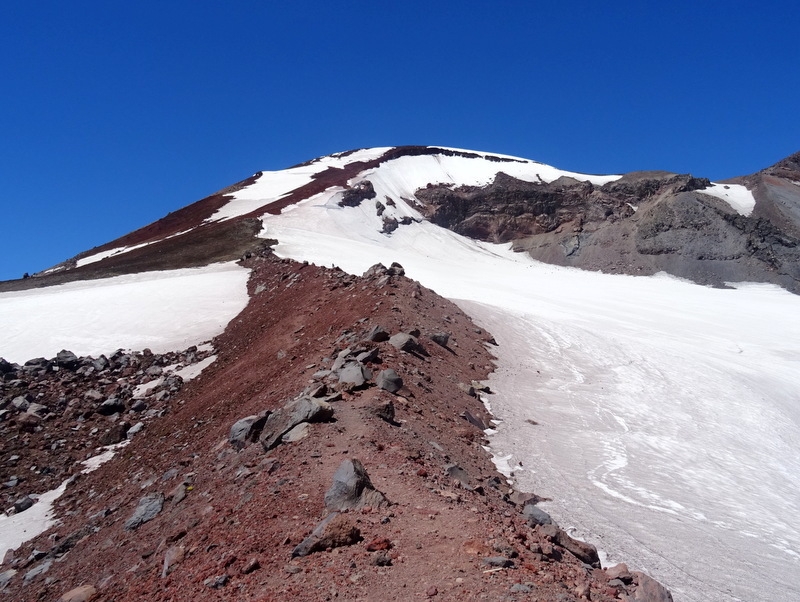 For a minute I wondered if they had stopped because someone got hurt, but as we climbed higher and it got steeper I realized that they only looked like they were not moving because the extreme slope and loose scree made the rate of travel excruciatingly slow. No camera trickery – it was really this steep! With wobbly legs and burning lungs, we made it to the top of the ridge. 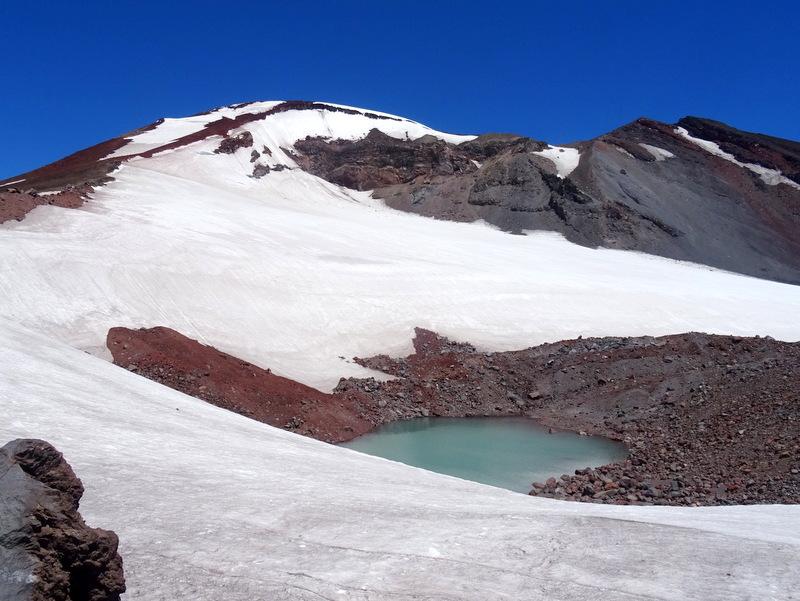 From here, it was only a short walk across a snowfield to the summit. We added another layer as protection against the fierce cold wind and set off. As you can tell by my hair in that last photos it was crazy windy up there. It was also really cold so we spent only a short time enjoying the view, took some photos, and started to make our way back down. Going down that last steep section was no easy task. We took it slow and tried to stay on the least used path. Once we got halfway down the scree section the crowds lessened and we passed only a handful of late-day hikers the rest of the way down. 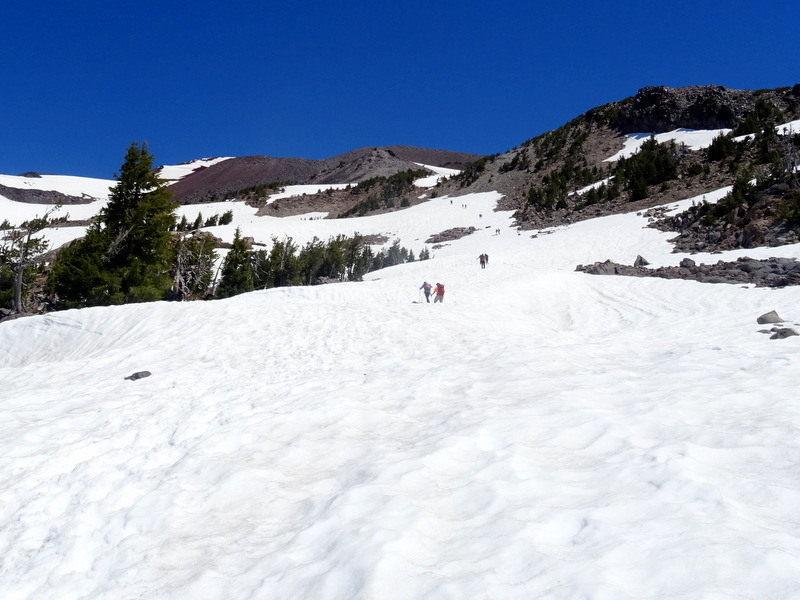 After carefully making our way through the rocky area, we were thrilled to reach the middle snowy portion. The snow had softened as the day went on and we gleefully slid down the soft slope trying our best to stay on our feet. I fell a bunch of times and my feet and ankles got really wet from the soft snow, but it was so much fun that I didn’t care. We made it back to the trailhead seven and a half hours after we started. 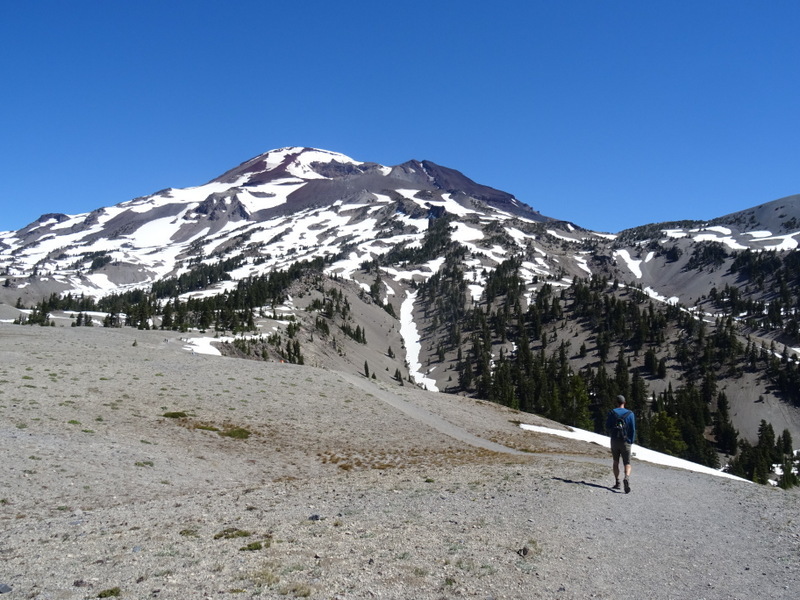 It had been a long day and our legs were tired and our faces sunburnt (forgot to apply a second layer at the top), but we were both grinning like fools as we looked back toward the mountain and realized what we had just accomplished. Congrats on your accomplishment! Me? 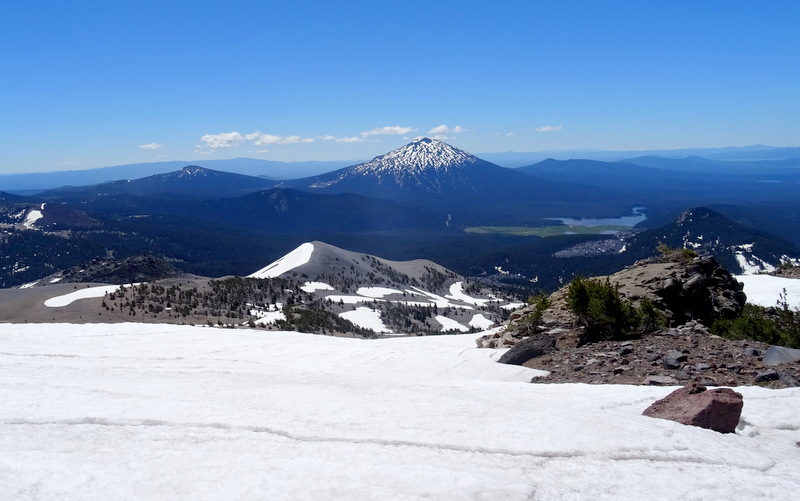 I would have turned back at the snow fields! 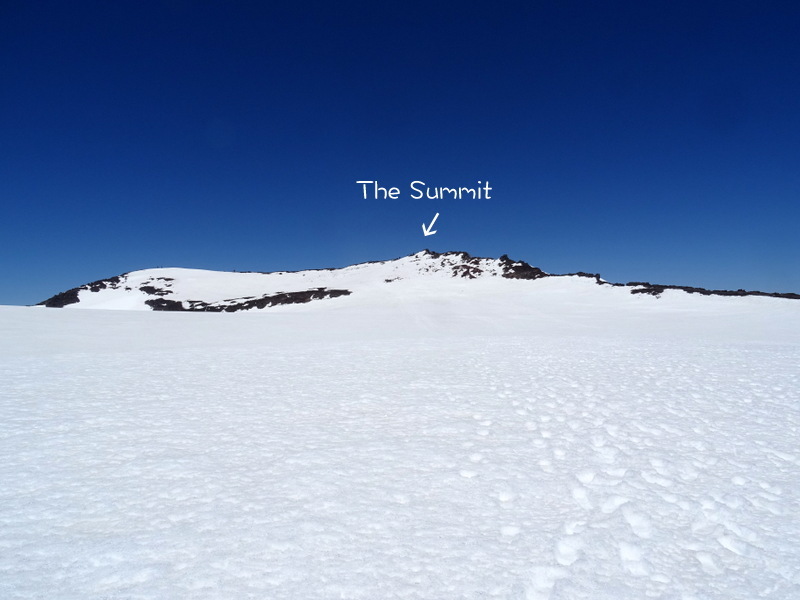 Great photos of a beautiful area and how the summit was accomplished. I am not normally one to shy away from a snowy hike, but that section was really, really difficult! You two are amazing. Glad you shared your pictures and experience. Now go take a rest. Great job! 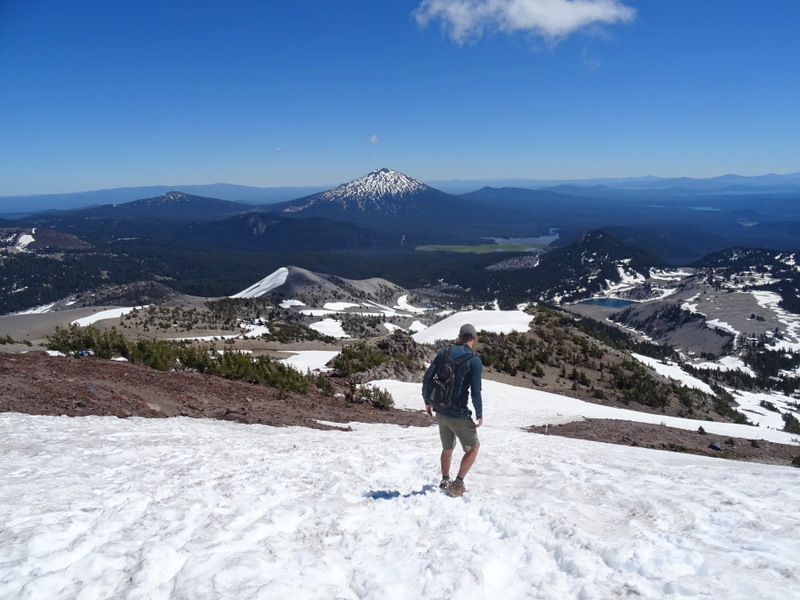 I love hiking in the snow in the summer in shorts. Boy, I know you were very glad you had your poles along. It isn’t the up that worries me on all those loose rocks, but getting back done. It would have taken me forever to get down even with my poles! The views were just amazing. A huge WOW!! You’re right, the downhill part with all the loose rocks was very tough. The poles helped for sure, but it took us a long time to make it down that last mile. These volcanic mountains are no joke! Awesome! 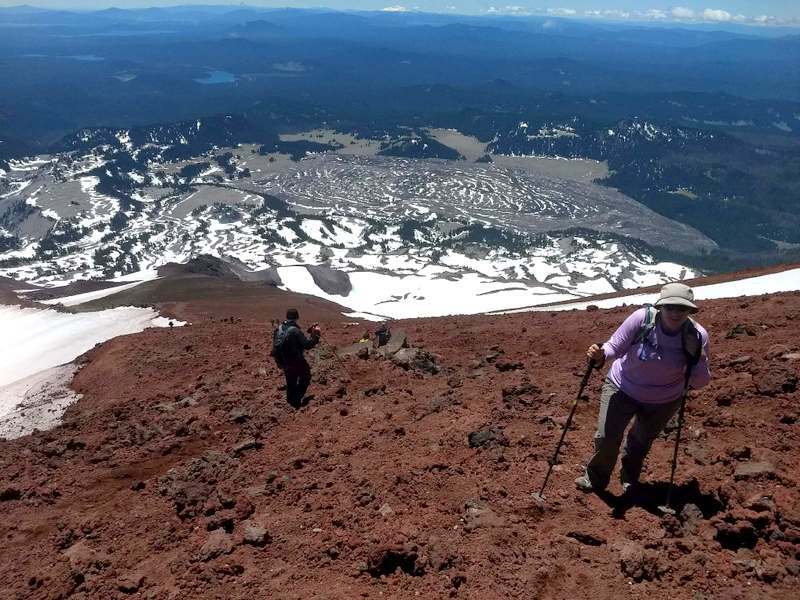 Looks like a truly challenging, yet utterly rewarding hike. Yes, very challenging, but the reward at the top (and the views the whole way up and down) made for a great pay off! Wow! 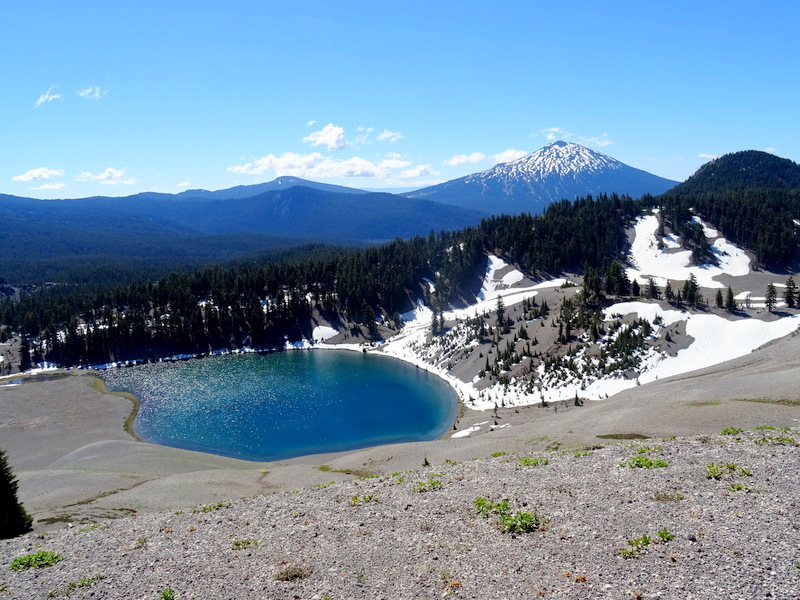 That’s a hike you’ll remember for a lifetime! Happy to have the memories since that’s one we don’t plan on tackling again anytime soon! Next hill: EVEREST! 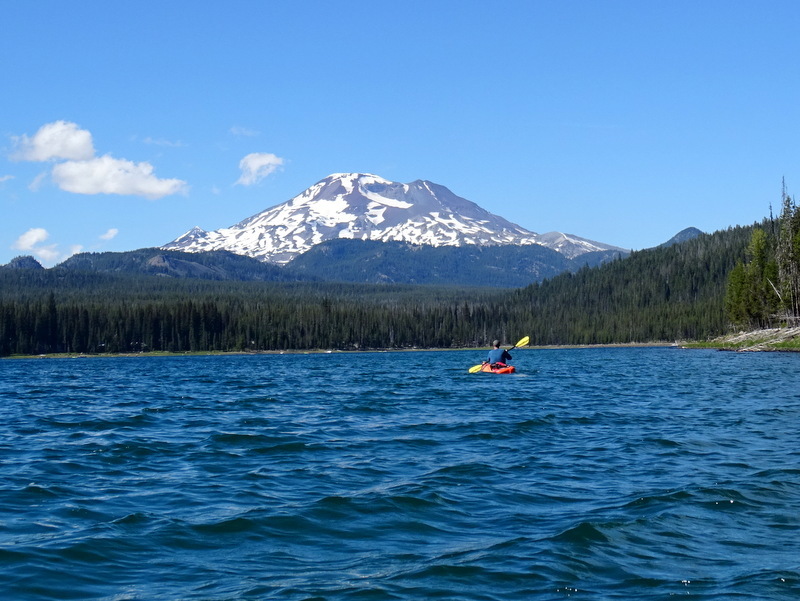 Living at sea level and visiting Sierra peaks once a year, I remember having breathing problems. Ha! We’re not that crazy! It’s always tough adjusting to the elevation. Anytime we go above 8,000 feet I can feel the lack of oxygen. Thanks for the pix and commentary. 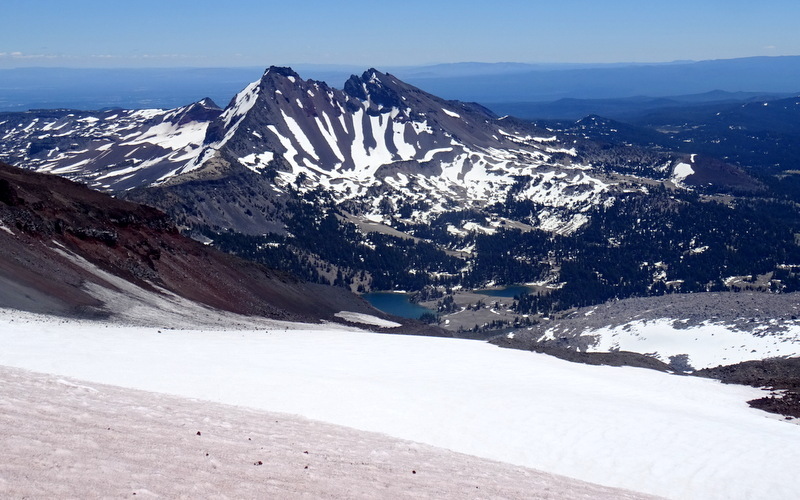 I’m heading up to climb Middle Sisters this summer. I think I’ll wait a few weeks for more snow to melt. You should try the Middle next time. It’s not a technical climb and there are far fewer people. A one day trip is very strenuous. 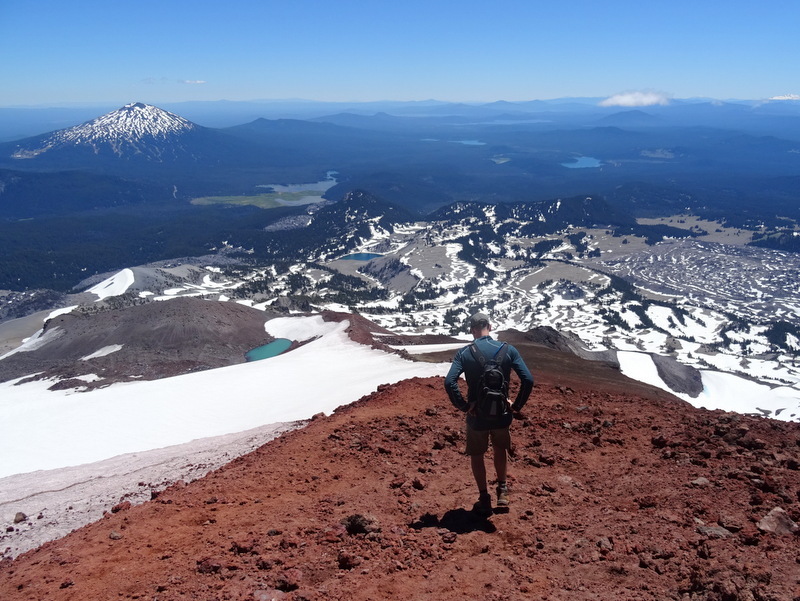 I usually backpack in about 6 miles and then summit the next day. 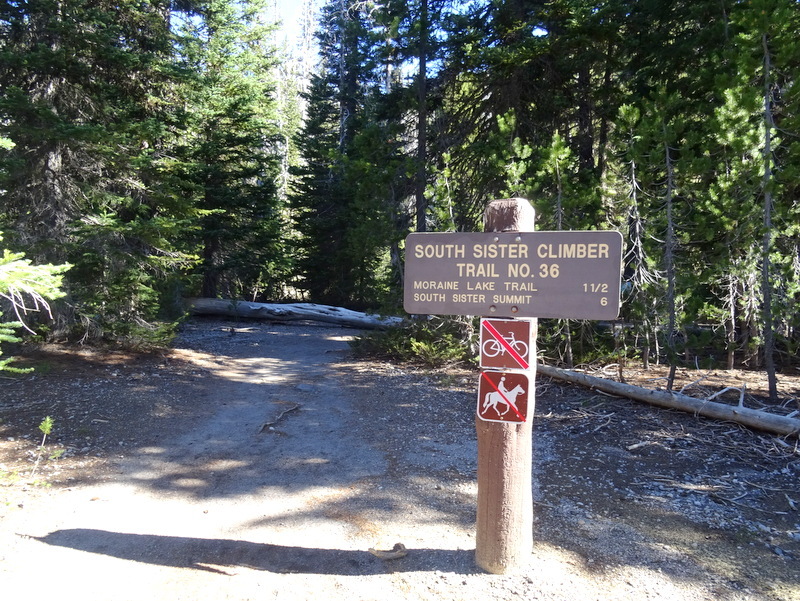 Pole Creek trailhead is a good access point. Such amazing views!! That volcano climb looks insane though :-) We’ve been wanting to explore this area and the resort looks like a sweet spot for us. It was a little insane ;) Yes, Lava Lakes Resort was a great spot for exploring the area! Good location, friendly staff, and nicely spaced sites. It was on the small side though so I suspect it’s one of those places you need to reserve a bit in advance. We’ve only been ‘Streaming 3 years but Sisters, OR is one of the most amazing little hamlets we’ve come across! Thanks for the wonderful pics! Nice pictures and travelogue! Love it. Congratulations on your adventure!